The giant squid is big. Very big. She's very proud of how big she is. She even thinks that she's the biggest thing in the ocean - bigger than shrimp, clams, and crabs. Even bigger than jellyfish, turtles, and octopodes. 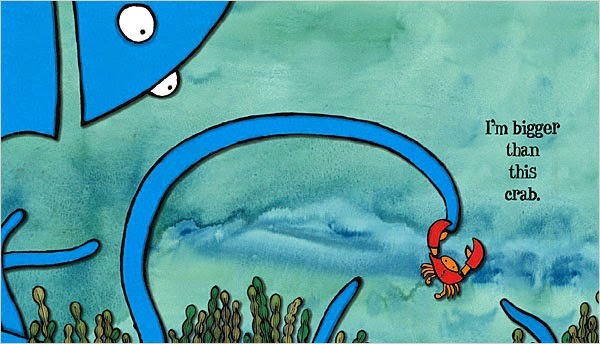 But she's forgotten that everything has to eat and that even giant squid have predators. Along comes a sperm whale and gobbles her up. Now worries though, optimist that she is, the squid realizes that she's the biggest thing in the whale! 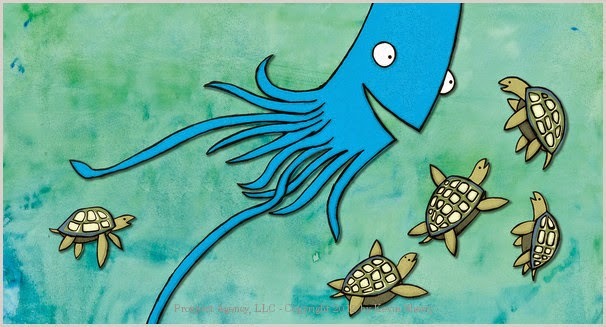 Kevin Sherry's delightfully playful I'm the Biggest Thing in the Ocean is a delightful read. The pictures are cute and they're even anatomically correct (no eyes on these clams). Packed with humor, this is a fantastic board book for your toddler (or your favorite marine biologist) to explore beautiful art and relative sizes.